Whether or not the game is any good doesn't matter as long as you have great eats: eating well during the game is nearly as important as the game itself. 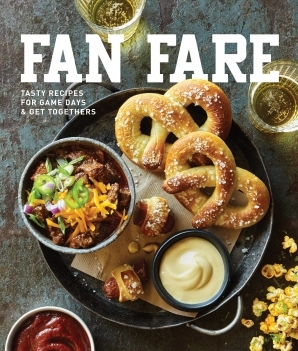 Packed with classic game day fare, from munchies and small bites to classic tailgating stand-bys and stadium standards, this book is your complete guide to game-day-grub. Small Plates: Ham and Cheese Stromboli, Tandoori Chicken Kebabs, Spicy Buffalo Wings, BBQ Baby Back Ribs, Pulled Pork Sliders, Hanger Steak Sliders, Buffalo Burger Sllders, Texas Chili, Taco Salad, Cheesy Pull-Apart Bread, Chicken and Artichoke Pizza, Sausage and Onion Flatbread, Sloppy Joes, Loaded Nachos, and a variety of Quesadillas, Twice-Baked Potato Skins, and Panini.